There ARE people in this world who care about wildlife, about the environment. People who, never having visited Africa or Asia, still feel the need to contribute towards the protection of the wildlife there – because it is part of one earth, a heritage to be preserved and protected. 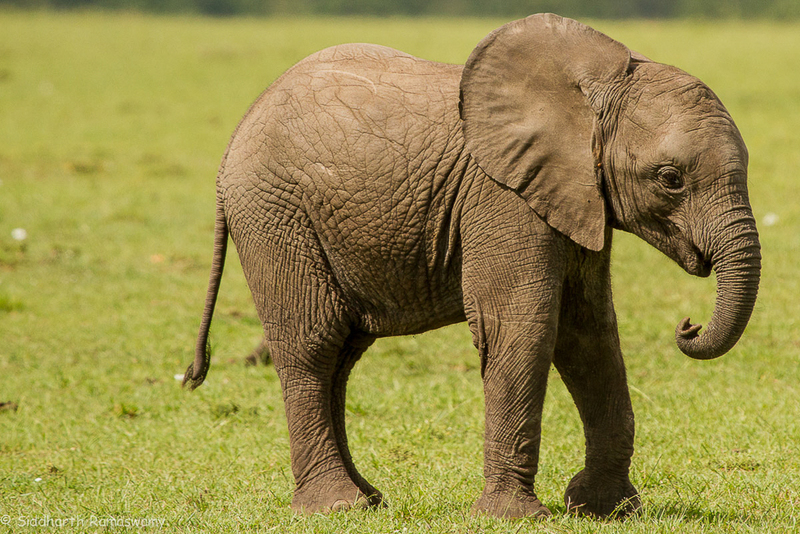 One unhappy day in October 2014 an elephant calf was orphaned in the Maasai Mara, Kenya. Her mother was poisoned – poached. We were mute witnesses to a herd in mourning and a devastated, confused baby in complete despair. A rescue was underway within hours by the guardian angles of such unfortunate babies – the David Sheldrick Wildlife Trust. Having been on the scene of the tragedy we had taken numerous pictures. We shared these on our blog as a photo-essay We also offered them to DSWT for their record of this latest orphan they had opened their doors and hearts to. On requests from some of our readers, we wrote the story in another post. Over the months we watched Roi (as she was named) settle into her new home, make friends, adopt her human keepers as her extended family. We visited her, photographed her and tried our best to spread the word about this wonderful organisation, the horrors of poaching and the trauma that animals suffer because of human-wildlife conflict and human greed. Of this strange and unhappy beginning were born unusual events and friendships. The original pictures of Roi with her family and dead mother caught the attention of National Geographic and some of them were used in one of their online articles. Subsequently, we noticed that a number of publications had used the pictures – without our permission! – in their articles. But since DSWT was always credited we let it pass. The pictures were doing their job – providing much-needed publicity for the destruction of wildlife in Africa. This is the photo I would like to use to create the design for a wood mural of Roi, if I may have your permission to do so. Unique wood art for the love of wildlife. 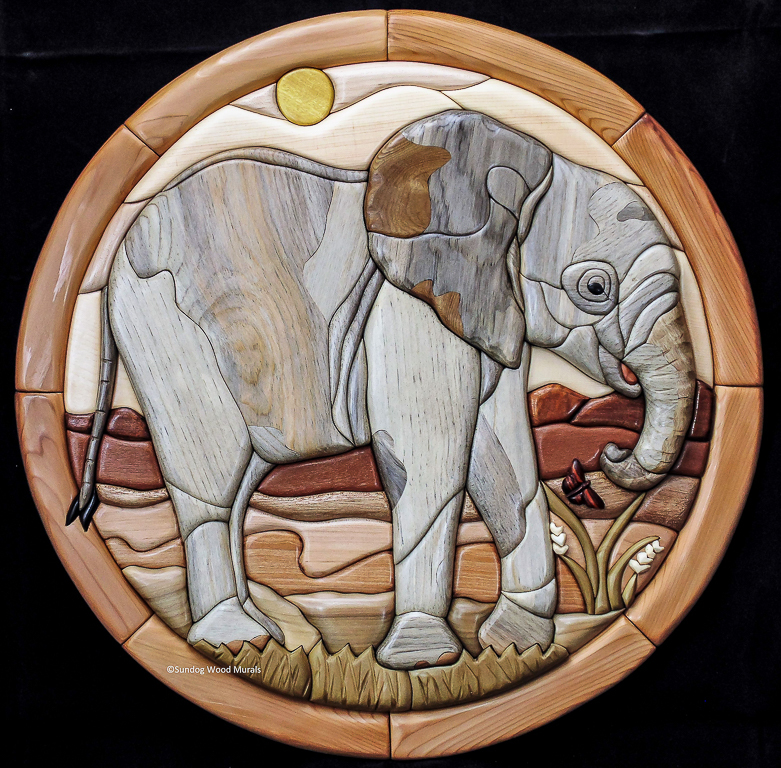 Featuring custom intarsia murals of elephants and rhinos. The most cursory look at Sherri’s work convinced us to share our photograph with her. Our only condition was that DSWT had to be a beneficiary. Sherri’s prompt response was all we could ask for. Indeed, if we had done our homework properly, we need not have hesitated at all! Almost a month later she informed us that the mural would soon be underway. Then came regular posts on her facebook page on the progress of her work. She was making two of them parallelly and they were incredibly beautiful works of art. Mid April 2016 we got a surprise from Sherri. The two murals were soon completed. The effort and love of both craft and cause clearly showed in every inch of the pieces. The details were incredible! 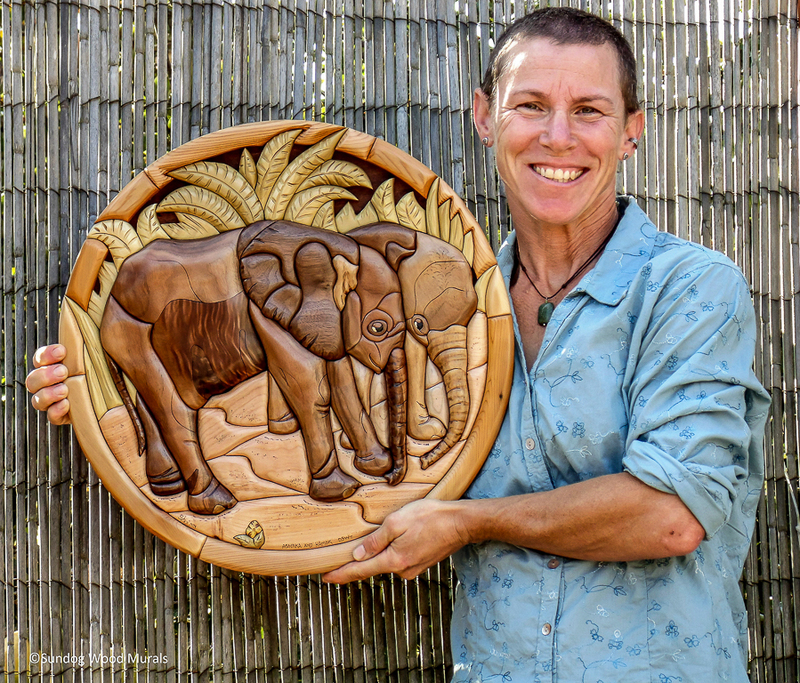 We needed to know more – the motivation behind this kind of work – what drove this artist to raise funds for elephants, what made her approach us. The story of Sherri. It is a story best shared with all of you in her own words. When I first heard the tragic news about Satao being killed by poachers, I was emotionally shattered. The senseless, savage slaughter of this majestic soul troubled me on such a deep level that I felt the only way I could move forward through my grief was to try to help the elephants by giving from the deepest part of my heart – through my art. After doing online research to learn about elephant conservation charities, I discovered the David Sheldrick Wildlife Trust. Their mission to rescue and raise the orphans left behind when mother elephants are poached resonated with me immediately, and so I contacted them regarding my interest in creating artwork which portrays their orphans and donating the proceeds to support their conservation work. The DSWT auctioned the very first of my elephant murals, titled “Ashaka and Kamok” for a final figure of US $ 6000 in March 2015. 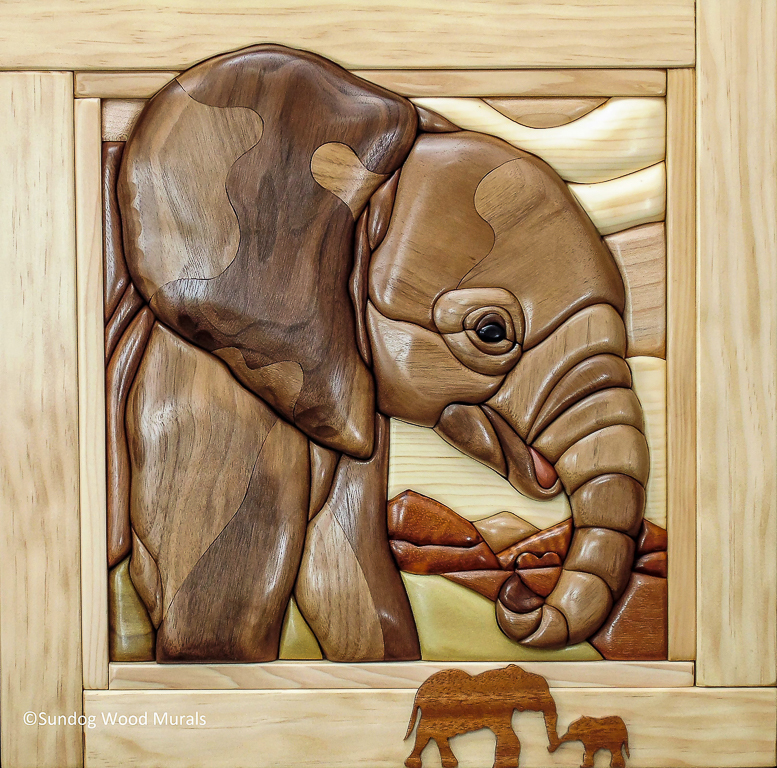 Since then, I have created and sold several more murals featuring many of the precious DSWT orphans. I donate a portion of the proceeds from each orphan’s portrait to the US Friends of the David Sheldrick Wildlife Trust in the form of giving a “Gift Foster” of a DSWT orphan to the person who commissions the artwork. I have also donated a new mural of orphan Mbegu to the DSWT, which will they be auctioning in the next few months. When I first saw in DSWT’s Facebook newsfeed the photos of Roi standing in grief over her slain mother, I was again struck by an overwhelming sense of loss as the photos let me look into the heartbroken eyes of this baby elephant. The juxtaposition of the images of Roi happily playing with her mother from the days before and now standing vigil over her mother’s body, visibly crushed by grief was incredibly powerful and poignant. Indeed, not since Satao’s death had photos and a story of tragedy haunted me so intensely that I couldn’t shake it from my thoughts or dreams. So, when I was contacted this February by a customer who was interested in commissioning a portrait of Roi, her foster elephant, my heart jumped at the chance to portray this special elephant and honor her powerful story through my artwork. In response to this commission request, I created two mural designs — one which reflects Roi’s playful, mischievous spirit (in reference to her naughty antics at the DSWT nursery, such as stealing milk bottles when the Keepers aren’t watching) and the transformation she and the orphans experience thanks to the rescue work of the DSWT; and one which pays tribute to the mother Roi lost and the new family and future she has found at the DSWT nursery. and the second mural is on its journey to Kenya where this story originated, a gift from my heart to Swati and Siddharth, for bringing Roi’s story to me and to the world. Obviously, this totally unexpected gift is very special to both of us! Sherri then discovered another way to raise funds for the cause by having metal prints made of her murals. These are made by having photographic images applied onto pieces of rigid metal as against a two-dimensional wooden sculpture. She is offering these at lower prices than for her original murals, thus allowing “Roi’s beauty and story” to be shared with more people. With caring, compassionate people like Sherri, Dame Daphne Sheldrick and her team at DSWT, there is some hope left for wildlife. We would like to add that all photographs provided by Sherri Lewis and quotations by her are included in this blog post with her explicit approval and permission. Thank you! Coming from a professional news woman – that is a real compliment! Yes Sherri and her work are amazing! Sherri lewis, what you have done is truly amazing and awe inspiring. In a world where people seem to have lost sensitivity and simple etiquette, it is heartening to see somebody like you prove that there is still humanity left in us. Thank you Sherri for making this world look beautiful! What a story! Delightful, inspiring and heart-rending; all at the same time! Omg this is such exquisite workmanship by a person with an even more beautiful heart. Sherri MUST visit Kenya. Swati, it is probably the most beautiful unexpected gift you have ever received! So precious. Its so nice to connect with you, Marilyn. Roi and her kin have had such a hard and horrid start to their lives. Yet, in their infinite wisdom and grace they give us the gift of new friendships. We too are waiting for our mural! Its such a special gesture from Sherri. We will cherish it always. Thank-you. Yes, an often pessimistic view of the state of the world is cheered by such sudden acts of generosity by people like Sherri. Thank-you. Yes indeed. Sherri is so talented and comitted. You are welcome, Sherri. Your talent and your commitment to causes like wildlife conservation can only bring much needed happiness in lives like Roi’s. Thank you so much for your beautiful photos! The ones with Roi after her mother had been killed are heartbreaking, but poignantly show the impact of poaching on elephant families. As a retirement gift, my colleagues gave me a foster elephant from The David Sheldrick Wildlife Trust, and the orphan they chose was Roi. 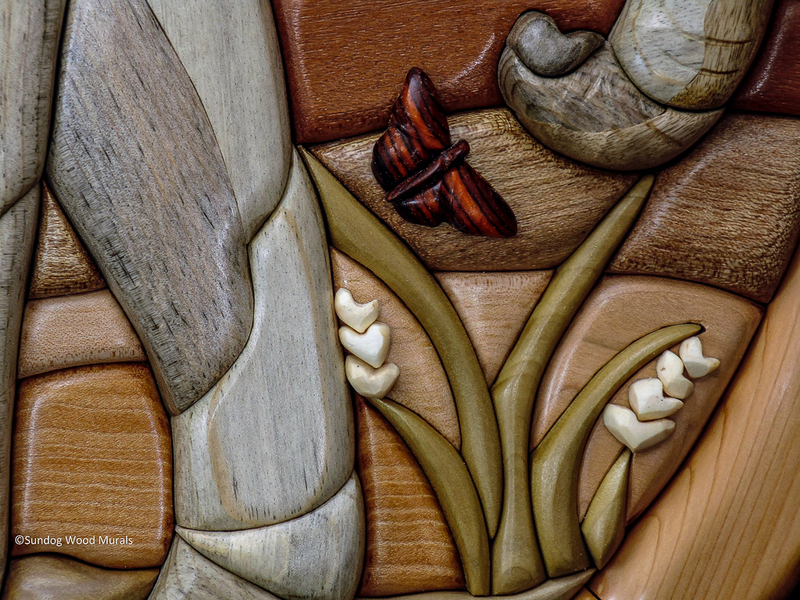 I had been following Sherri’s artwork on her Sundog Wood Murals site and was captivated with the exquisite detail, each mural showing the individual personality of the elephant. I was also impressed that Sherri donates a portion of the profits from each commissioned mural to The David Sheldrick Wildlife Trust, recognizing how important their work is on behalf of these orphans. Receiving Roi as a foster gift was the impetus for me to contact Sherri about commissioning a mural of my own. I could not be more pleased with that decision! The mural of Roi is gorgeous and a delight to see each day. Having it in my home has also allowed me to share your photos of Roi’s early grief as an orphan as well as her progress in the able care of the Keepers at the DSWT. So many wonderful connections have been made since receiving this retirement gift – it truly is the gift that keeps on giving. May there come a time when elephants, and all wildlife, are valued as fellow beings, rather than for their monetary worth. Beautifully written Swati! It is wonderful to know so many people care for our environment and our animals, especially the elephants. I love the elephant murals and the idea behind it! God Bless everybody who care for the lovely animals God has created! Congratulations…Am sure it brought a tear or two to your eyes! My heart is filled gratitude and love reading this! Thank you so much for sharing my artwork — my “art with heart” — with the world and for allowing me to use your amazing photo of Roi to support DSWT’s work rescuing these precious animals. You have given all of us a gift in capturing and sharing Roi’s story, and I am honored to be a part of such a special effort to help Africa’s wildlife through sharing it’s beauty and power.